Steven Reilly ’17 (BUS) shares his circuitous path into a marketing thesis project on Daily Fantasy Sports. 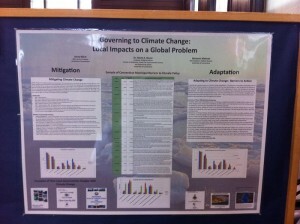 As with many things at UConn, the Honors Thesis experience is ultimately what you make of it. To some students, it is a culmination of their undergraduate careers. To others, it is a chance to delve deeply into a topic that they find interesting. And to some, the Honors Thesis is the final lengthy paper that they will complete before stepping into the real world. For me, the Honors Thesis was all of these things and more. My thesis ended up acting as a capstone project that required me to reflect on the different Marketing classes I had taken, and to utilize all of the skills that I had learned. However, it did not begin like this. Like most students that I have spoken to, my thesis project began with a great deal of uncertainty. I was having trouble finding an advisor largely due to my inconclusiveness towards what topic I wanted to research. I was also anxious about picking a topic that didn’t have a substantial amount of previous scholarly research, since I was so familiar with creating papers that sourced peer-reviewed journals. I knew I wanted to spend the Fall semester of my senior year researching my thesis topic before writing the actual thesis in the Spring, but as August crept up, I recognized that I needed some guidance. I scheduled an appointment with my Honors advisor. While I had visited my Honors advisor before my senior year, it was never for anything beyond a couple questions about course selection. I had always prided myself on being able to determine my own schedules and course loads, but I also realized that I could use all of the help I could get on my Honors Thesis. When I told Dr. Narasimhan Srinivasan, my Honors advisor, about my issue, he was quick to come up with a solution: He would serve as my Honors advisor for any topic I chose, as long as I promised to show interest and work hard. This sounded like a fair deal to me, and I went to work looking for a topic. The first couple of topics I discussed with Dr. Srinivasan were viable ideas, but they lacked the element of interest that we had spoken about earlier. I wanted to pick a topic that I could relate to through personal experience. After more deliberation, I decided to study the Daily Fantasy Sports (DFS) industry. I have always been a huge sports fan, and the dynamic billion-dollar DFS industry had recently come under scrutiny due to its similarity to illegal online gambling. Dr. Srinivasan encouraged me to research this idea, since I had experience playing the game and had an interest in the industry overall. While the Daily Fantasy Sports industry is a lucrative one, its relative youth made it difficult to research. While I had skills from my Intro to Marketing classes to analyze Daily Fantasy Sports companies through SWOT analyses and understanding of key business elements, there weren’t many peer-reviewed articles on Daily Fantasy Sports (as opposed to season-long fantasy). The companies that did produce research reports charged a great deal of money for them. Dr. Srinivasan had an inventive way to overcome this obstacle: he recommended that I email the company and see if they would give me the report for academic purposes only. Sure enough, after one persuasive email, the research firm was happy to oblige. With my newly acquired research reports, I was ready to compile my own findings on the Daily Fantasy Sports industry. In December, with my preliminary research completed, I was prepared to move on to my actual Honors Thesis. While I had learned a lot about the industry, its companies, and its legal climate, I did not feel that I had a good grasp on its customers. In multiple Marketing classes, we are taught that customers ultimately act as the vehicle that determines the value of a product. So, in order to learn more about Daily Fantasy Sports players, Dr. Srinivasan and I created a Qualtrics survey to distribute to those who had played Daily Fantasy Sports in the last 12 months. We submitted the survey to UConn’s Institutional Review Board. After a fairly lengthy IRB approval process, I was given permission to distribute the survey. Because of our niche target demographic, I needed to get creative with how I procured responses. I distributed the survey on Reddit websites that catered to Daily Fantasy Sports. With the help of the OUR Supply Award, I also distributed the survey through Amazon MTurk, a website that allows you to pay survey respondents a small fee for successfully completing your survey. I had over 1,000 responses to the survey within a couple of weeks. After a weekend spent brushing up on statistical software that I had learned to use in my Marketing Research class, I was ready to test my hypotheses. A series of different tests revealed quickly that many of my hypotheses were untrue, and many of my projected correlations were not as strong as I thought they might be. Dr. Srinivasan reminded me to not get discouraged, since learning that you are incorrect is a vital part of the research process. Nevertheless, while I had been wrong is some of my assumptions, I found different new and interesting trends that I ended up writing about in my final paper. In the final weeks of the semester, I completed my Honors Thesis and turned it in to the Honors Office. What a sense of accomplishment! The Thesis experience was truly a journey that forced me to hone many skills that I had gained through my college career. I had used my basic understanding of business elements to break down an industry. I used my understanding of marketing strategy to prognosticate potential next steps companies in the industry might take. I persuaded a research firm to provide me with information utilizing some of the tactics taught in UConn sales classes. I also used statistical testing and writing skills I had obtained in prior classes to put together the final report. Overall, my Honors Thesis was truly a capstone project that revealed to me how many different talents can be combined to create a successful project. Now that my time at UConn is over, there is so much to remember: experiences, friends, classes, professors, and more. My Honors Thesis experience will be one of the many positive experiences I look back on anytime I reflect on my time at UConn. While the process was a challenging one, it was made easier by Dr. Srinivasan, as well as the many advisors and professors that provided me with a helping hand along the way. I know that I will face many more challenges as I head off into the working world. I can only hope that I will be provided with the same support that allowed me to succeed at UConn in my future endeavors. Heather Winter ’16 (CAHNR) explored her interest in bioactive food components through undergraduate research. She shares her reflections on the impact of her research experiences in the essay below. My journey into scientific research began with a class in nutrition that I took at Manchester Community College, which sparked my interest in researching the medicinal functions of food, and its bioactive components. After earning an Associate’s degree from MCC, I began studies in Nutritional Sciences at the University of Connecticut. I soon learned from my advanced nutrition classes that I was primarily interested in the molecular side of nutrition, and upon the recommendation of my advisor, began looking into research being conducted in laboratories within UConn’s Nutritional Sciences department. My search led me to contact Dr. Christopher Blesso, whose lab researches the use of bioactive food components, such as polyphenols in elderberries and grapes, for the prevention or reversal of chronic diseases. I started independent study research in the first semester of my senior year, and gained my introductory experience in laboratory work. I shadowed the graduate students and advanced undergraduate students, familiarizing myself with laboratory techniques and the various experiments being conducted in the lab. With mentoring from the graduate students, I learned how to perform assays, such as triglyceride quantification from plasma samples, and carried out data analysis. As I progressed in the laboratory, Dr. Blesso and I developed ideas for my own independent project, and I chose to learn cell culturing techniques so I could carry out experiments focusing on a bioactive component of milk called sphingomyelin. My interests were in studying the role of sphingomyelin as a dietary intervention for non-alcoholic fatty liver disease, modeling the disease state in a cancerous liver cell line. Once I had a plan for my own research project, Dr. Blesso suggested that I apply for the OUR Supply Award to help fund my experiments. After receiving the news that my OUR application was accepted, I was excited to conduct my own cell culture experiments with sphingomyelin. In addition to cell culture techniques, I learned how to perform lipid and protein extractions, then perform further biochemical assays to quantify the results of my cell culture experiments. Based upon the data I collected, I was able to perform a qualitative analysis of the role of sphingomyelin and determine its active function in reducing lipid accumulation in liver cells. The data I collected provided a foundation for the laboratory to move forward with further experiments to assess the function of sphingomyelin, and its potential mechanisms of action. 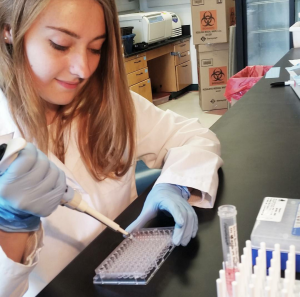 My undergraduate research experience allowed me to discover my ability to excel in a laboratory environment, and after graduation, led to the opportunity for me to begin working as a Research Specialist in UConn’s department of Pharmaceutical Sciences, focusing on natural products research. Along my journey in scientific research as an undergraduate, I gained an incredible amount of knowledge, and developed many skills that have been fundamental for my advancement in research after graduation. I am immensely thankful for those who provided mentorship throughout my undergraduate research, and for the opportunity to conduct scientific research from such an early stage in my career. 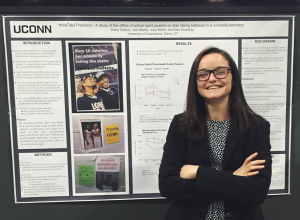 Kate Boudreau ’17 (CLAS) earned her bachelor’s degree this spring and shares her serendipitous introduction to health psychology research in this essay. Upon entering UConn as a Chemistry major, I pictured my future involvement in undergraduate research in a lab filled with beakers, chemicals, and expensive equipment. Even so, research was not at the forefront of my freshman agenda. I was sufficiently overwhelmed trying to find the delicate balance between succeeding in organic chemistry, getting involved in the right extracurriculars, making friends, and sleeping. My only exposure to research that year was my Honors First Year Experience class called Discovering Undergraduate Research, which helped to open my eyes to the many different types of research happening at UConn. I discovered my research accidentally when I came across an ad in the Daily Digest that piqued my curiosity right at the time that I was considering changing my major. This allowed me the privilege of taking a special one-year, 10-credit class called Obesity Prevention Learning Consortium as a sophomore, that would ultimately change the course of my college experience. In this class, a mixture of undergraduate and graduate students studied the world obesity epidemic in-depth and discussed potential strategies to combatting weight gain to improve global health. In small groups, we designed our own research projects that aimed to change or prevent behaviors that could lead to unhealthy weight gain in UConn students. This class was eye-opening for me because for the first time, I felt like I was taking an active role in my education and getting to learn about a critical issue through the lens of hands-on research experience. Furthermore, as a pre-medical student taking plenty of lab science classes, I was excited to discover the realm of health psychology research as well as the importance and fascination of working with and studying people. Our projects were completed in Spring 2015 under the guidance of Dr. Amy Gorin, with the encouragement that each group considering furthering their research by submitting abstracts to conferences or editing manuscripts for potential publication. Finding the class and the project rewarding, I jumped at this opportunity to share what I had learned with a community of like-minded researches. Our expectations were low but we were hopeful as we submitted abstracts to international conferences where undergrads rarely present, which made the news even more exciting when we found out our project had been accepted as a poster presentation to The Obesity Society in Los Angeles, California. The pressing question then became: How do we get to California? This is where the Office of Undergraduate Research played a fundamental role. Thanks to the Office of Undergraduate Research, I was awarded a Travel Grant that assisted with the expenses involved in flying to and staying in California to present my work. Although I could only be in Los Angeles for 48 hours, my trip was overflowing with plenty of new experiences and adventures. Not only did I get to present as an undergraduate at an international conference, but also I experienced the great food in LA, visited the famous farmers’ market, and hiked to the Hollywood sign. Furthermore, being an independent traveler proved to be an invaluable experience in and of itself. In presenting my poster—a study of college students’ stair taking behaviors in university dormitories with and without motivational signage—I enjoyed the opportunity to talk to experts in the field about my project. Many were interested in what we had done and others provided thoughtful commentary about considerations for future studies. 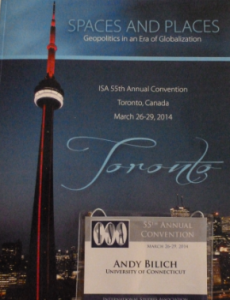 Additionally, I got to talk to other presenters and learn more about recent studies in the field. I continued working as a Research Assistant in the UConn Weight Management Lab and am completing my Honors Thesis related to a couples’ weight loss study. As a freshman, I could not have imagined that I would be so involved and passionate about research in health psychology come my junior year, but I cannot express my gratitude for the opportunities provided to me at UConn that allowed me to accidentally stumble upon this path. As obesity becomes an increasingly grave problem in the United States, I am certain that I will be involved in combatting it for the foreseeable future as I pursue a career in medicine. Kelsey Richardson ’15 (NURS) earned her bachelor’s degree this spring and shares her “accidental” journey into research in this essay. I had never thought upon entering nursing school that research was even a remote possibility for me. When my advisor suggested joining the Honors program my sophomore year, I was interested but a little hesitant. I thought Honors meant taking extremely hard classes and losing all my free time. Instead, in the nursing program, Honors meant finding an advisor and completing a research project with their guidance and expertise. Then, finally, if you found new results, you would be able to submit your findings to be published. This sounded interesting to me and thankfully I took my advisor’s advice and started an amazing journey down the research path for the past three years. I learned that not only is research ever changing, but even students can make discoveries that can improve the practice and lives of others. 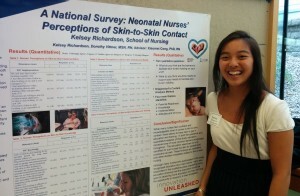 Kelsey Richardson ’15 (NURS) presents her research poster at the 2015 ATHENA Nursing Research Conference. My trip down the research road started with finding an advisor. I was lucky enough to meet Dr. Xiaomei Cong, who is involved with so many amazing projects it was hard to pick just one to make my own. We decided that I would use a survey that had already been created and tested to further investigate neonatal nurses’ perceptions of the phenomenon known as Skin-to-Skin Contact or Kangaroo Care. First, I completed my preliminary literature review, searching multiple databases to see what was already published about Kangaroo Care. Not only did I learn about this intervention, but I also learned how to search the databases, save my results and pick out was and was not important. These skills helped me immensely in the next few years as a student when we needed to do research on a multitude of topics for various classes. 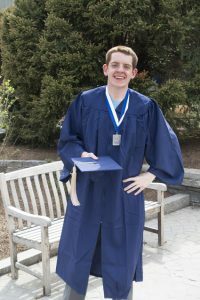 Richard Wolferz, Jr. ’15 (CLAS) recently graduated from UConn as an Honors Scholar in Biological Sciences with a second major in Physiology & Neurobiology. 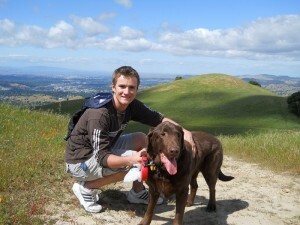 In this essay, he describes the role that research played in his undergraduate career. 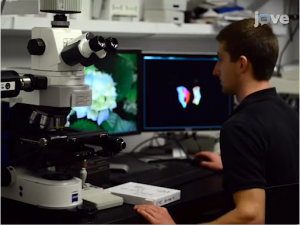 ​Richard Wolferz, Jr. ’15 (CLAS), demonstrating his protocol to create three-dimensional lateral ventricle reconstructions featured in an upcoming Journal of Visual Experiments publication from the Conover Lab, Physiology and Neurobiology. I grew up and went to high school in New Jersey but was convinced on my first visit that the University of Connecticut was right for me. UConn is a great combination of a small town campus feel mixed with a world-renowned research university. One of the main reasons I came to UConn and chose the majors I did was for the opportunity to perform scientific research as an undergraduate. Research has been large part of my undergraduate career and has given me incredible hands on experience that many students do not see until graduate school. After hearing about her research, I spoke with Rebecca Acabchuk, the graduate TA for my sophomore year Enhanced Anatomy and Physiology course. I explained to her how interested I was in the concussion research she was doing in Dr. Joanne Conover’s lab. After speaking further with Rebecca, and then with Dr. Conover, I was granted an opportunity to try volunteering in the Conover lab during the summer of 2013. Right away I was given responsibility to begin refining a technique to better analyze the expansion of the lateral ventricles in response to repeated concussive impacts. I was hooked. Nellie Binder ’15 (CLAS) recently completed an individualized major in International Relations and will start law school in Fall 2015 to pursue her interests in immigration, asylum, and refugee law. In this essay and memoir, she shares her undergraduate research on Holocaust memorialization in the U.S. and in Poland. The research for my 2014 SURF project, titled “Implications in the Past and Present: Holocaust Memorialization through Photographs, Camps, and Museums,” took place mainly in Poland and Washington D.C. While in the capitol, I spent multiple days in the US Holocaust Memorial Museum, which gave me the chance to examine each exhibition with particular care, keeping in mind how the museum functions within the realm of Holocaust memorialization. I was able to contrast this research with my experience at the actual sites of destruction: the concentration camps themselves. After going to Auschwitz, where I saw groups of Israeli protesters as well as masses of IDF soldiers in uniform, I also began considering the connection between Holocaust memorialization and the ongoing Israeli-Palestinian conflict. How do differing opinions about the Holocaust translate into dialogue regarding the conflict? This observation was critical as it enabled me to connect my research on the past with one of the most highly debated international conflicts in the present. 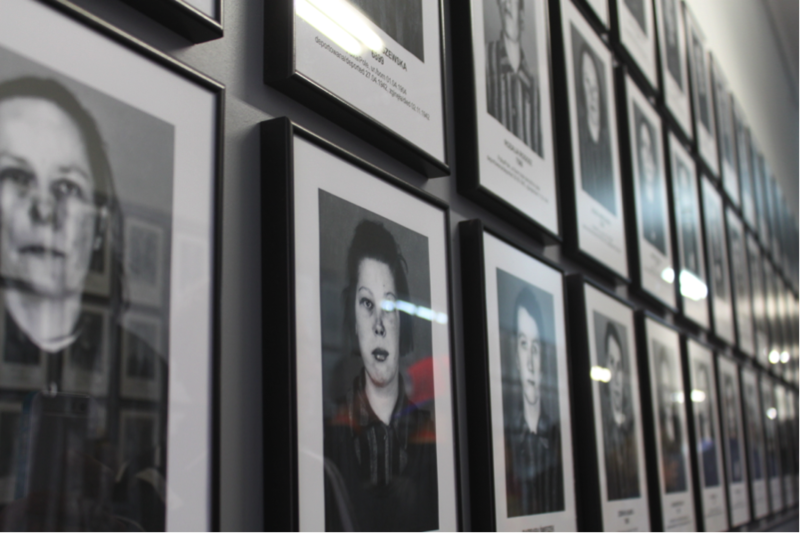 “Faces before death.” Taken in Auschwitz, 2014. Photo by Nellie Binder. Aaron Rosman ’16 (CAHNR) is a member of the second cohort of UConn IDEA Grant recipients. 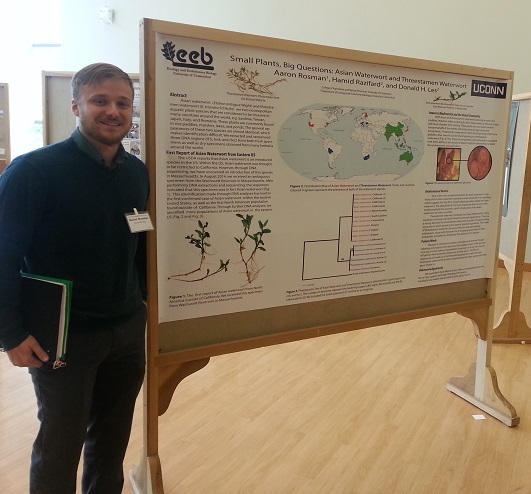 Aaron’s research focuses on clarifying the species boundaries between different kinds of waterwort, or Elatine, considered invasive species in many countries. Through DNA sequencing, Aaron and his advisors determined that Elatine ambigua Wight (Asian waterwort) and Elatine triandra Schkuhr (threestamen waterwort) are indeed distinct species. Further, they documented the first confirmed case of E. ambigua in the United States outside of California. Aaron Rosman’s green thumb and familiarity with UConn made applying to CAHNR an easy decision. While studying natural resources with a concentration in forestry, Aaron spends his free time conducting research and volunteering on a student farm. Here is what he said in an interview. What attracted you to UConn? Storrs is my hometown and both of my parents have worked at UConn, so UConn has always been a big part of my life. When I was applying to colleges, I considered some other schools, but nothing appealed to me like UConn. In addition, I knew that UConn began as an agricultural school and was strong in that field. Since I wanted to study natural resources, this definitely helped solidify my decision. Why did you choose your particular major? I have always loved plants, especially trees. Since I was six years old, I have been playing in the woods. I cannot think of anything better than being able to continue to do this for the rest of my life. That is why I decided to major in natural resources with a concentration in forestry. Chris Kegler ’15 (CAHNR, CLAS) received a donor-funded Summer Undergraduate Research Fund (SURF) Award for summer 2014 to study the process of self-identifying as HIV-positive. Chris traveled to Atlanta, GA to facilitate focus group discussions about the identification process and is now completing his data analysis. 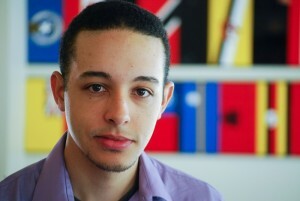 While at UConn, Chris Kegler immerses himself in research and health promotion. After he graduates this spring with a dual degree in allied health sciences and psychology, Chris wants to delve into the complex and multi-faceted field of HIV/AIDS research. Here is what he said in an interview. What attracted you to UConn? I grew up in Storrs, and so I have always been familiar with UConn. I knew many students and professors who all had great experiences here. After I received a scholarship, this solidified my decision, and I knew that UConn was the right place for me. Why did you choose your particular major? I entered UConn as an undecided major who was leaning towards nursing. However, during my freshman year, I started working in a psychology laboratory that dealt with behavioral HIV/AIDS research. I completely fell in love with the work that I was doing, and I decided to choose psychology as my major. Later, I also realized my passion for public health, and I decided to add allied health sciences with a concentration in public health and health promotion as my second major. Now, I am getting a dual degree in allied health and psychology. I am interested in behavioral medicine and interventions for people living with chronic illnesses, and I love that my dual degree allows me to explore this from multiple perspectives. Which one of your UConn activities, internships or jobs was the most memorable? Why? My most memorable part of UConn is my research. My main research experience has been with the Southeastern HIV/AIDS Research Evaluation (SHARE) Project, through UConn’s Center for Health, Intervention and Prevention (CHIP). Last year, I received a Summer Undergraduate Research Fund (SURF) Award so that I could continue working for the SHARE Project over the summer. My research looks at the process people go through when they identify as HIV-positive. I study how people diagnosed with a chronic illness, such as HIV, finally come to terms with their condition. This process of self-identification is extremely complex and can take years, and so I investigate what helps or hinders this process and the psychological health outcomes it can have. Andy Bilich ’14 (CAHNR) recently graduated with bachelor’s degrees in Natural Resources and Resource Economics and minors in Political Science and Environmental Economics and Policy. In this essay, he describes his experiences as an undergraduate researcher at the University of Connecticut. I am originally from San Ramon, California, but I came to the University of Connecticut in the fall of 2010 and will graduate with a BS in Natural Resources and a BS in Resource Economics in May 2014. In my four years at the University of Connecticut I have had the incredible privilege to be an undergraduate researcher. This experience not only prepared me well for the job and graduate school markets, but also gave me the opportunity to travel, present at conferences, and meet and work with professionals in my field. I got started in the fall of 2011 when I reached out to a Dr. Mark Boyer, the professor of my global environmental politics class, with some questions that had come up in my summer work. I spent the summer as an energy policy analyst intern at Energy Commercialization LLC working on presentations on renewable energy deployment in the Middle East and India and the creation of the California carbon trading market. My professor met with me and we talked about the research and after our discussion, he offered me a research assistantship on his new project. This ongoing research project is looking at local governance for climate adaptation policies. Along with a PhD student, I have been gathering and analyzing climate change adaptation policy and initiatives data for 169 Connecticut townships, which Dr. Boyer is using to write a book about local governance and the issue of climate change. The data will also be published into a database that will allow users to search for specific types of policies and initiatives undertaken by towns with specific demographic, geographic, and economic characteristics. Hopefully this database can help to positively influence future environmental and climate change governance. During this project, I applied for and was awarded a Social Sciences, Humanities, and Arts Research Experience Award (SHARE). This award provided me with funding to continue the research that I was conducting with Professor Boyer, but more importantly it gave me the ability to attend the Frontiers in Undergraduate Research Poster Exhibition as a student researcher. For this event I prepared a poster summarizing some of the preliminary results and trends of the interviews of town policy officials that I helped conduct. This was an awesome opportunity because it allowed me to practice presentation skills and gain a better understanding of the data I was working on and some of the questions that people had about it. This was valuable and practical experience that I built on for future presentations. In the spring of my senior year I received a Travel Award from the Office of Undergraduate Research which helped me to travel to Toronto for the 55th Annual International Studies Association Conference on Geopolitics and Globalization. 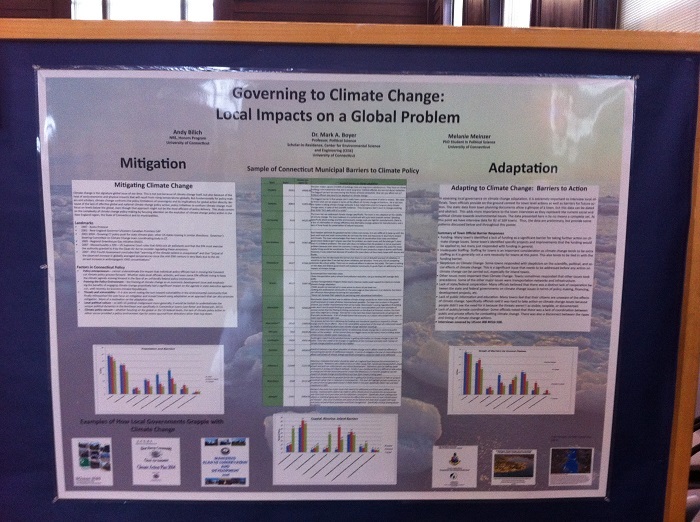 As part of this amazing trip I presented some of our research findings on policy drivers for climate adaptation policy in Connecticut towns. I also met professors and researchers from around the world and attended panel discussions on water security, energy deployment and security, environmental justice, climate change, and geoengineering. It is clear to me that my experience in undergraduate research was the most important and formative thing I did while at the University of Connecticut. As a graduating senior, there is no better piece of advice I can give to current and future UConn students than to get involved with research. The research experience that I have had has given me all of the skills and confidence I need to succeed in the next chapter of my life. This fall I will be building upon this foundation as I pursue a Master’s of Environmental Management in Energy and Climate Resources at the Bren School of Environmental Management at the University of California Santa Barbara. Carl D’Oleo-Lundgren ’14 (CLAS), an individualized major in international relations, aspires to earn a master’s degree and join the Foreign Service. As part of his undergraduate studies, Carl collaborated on a SHARE Award project with Dr. Prakash Kashwan, a faculty member in the Department of Political Science. The SHARE Award supports research apprenticeships for students majoring in the social sciences, humanities, and arts to enable these students to explore their research interests and build inquiry skills. A summary of this particular SHARE project follows. Could a Union Save this Planet? How does international relations theory compare with practice? How do expectations compare with results? How promising are results of IUCN projects? In addition, they examined the United Nations Framework Convention on Climate Change (UNFCCC), seeking to understand the role of growing civil society participation in international climate change negotiations. In particular, they were interested in the role of networking NGOs. Ultimately, they concluded that the future of international climate change action is unclear. In the wake of messy negotiations in Copenhagen, the UNFCCC will continue to restrict civil society participation in the short to medium term. Learn more about Carl’s undergraduate career, including a range of research experiences, in this UConn Today profile.